Painted Sneakers | Project | Kids VT - small people, big ideas! Want to start summer on the right foot? Canvas sneakers are lightweight, breathable and easy to slip into when the ice-cream truck is coming. They're also cheap enough that it's OK to wreck them with the mud, dirt and sand that accompany outdoor play. But as blank canvases, they're not much to look at. Here's a way to transform them into personalized, pumped-up kicks. Cover your work space with sheets of newspaper. Use masking tape to cover the sole or other areas of the shoe that you don't want to get paint on. Decorate the sneakers as desired. 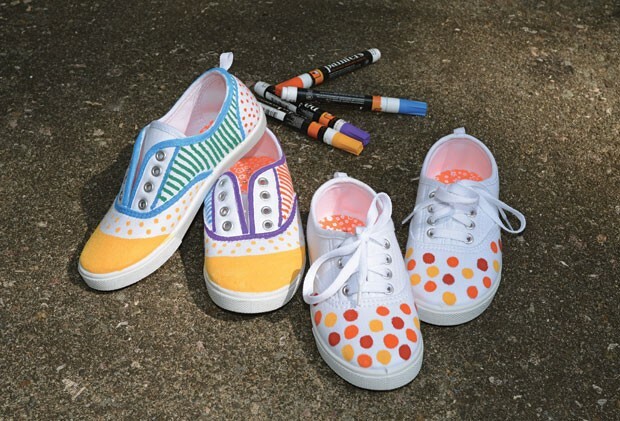 Use acrylic paint and brushes to cover large areas of the shoe, or use paint pens for more detailed designs. Paint pens are easy to use and don't create a lot of mess. Let the paint dry completely before peeling off the masking tape. Lace up the sneakers, and you're ready to go.